After a four splash free agent signings the Green Bay Packers have given themselves flexibility in the draft and these are three players they should now target at pick 30. It’s been an active offseason by the Green Bay Packers standards and rightfully so. After missing the playoffs for the second consecutive season, General Manager, Brian Gutekunst is doing everything he can to make this team a Super Bowl contender once again. Up to this point, just about the entire coaching staff has been overhauled and in unusual fashion, the Green Bay Packers were very active in free agency making four big signings. In addition to adding four talented players to this roster, those signings have given Green Bay much more flexibility in the draft so they don’t have to feel locked into certain positions at various points in the draft. It was clear that this roster needed an infusion of playmakers and with three picks in the top 50, the Packers find themselves in position to do just that. In my previous article we went through three options for Green Bay at pick 12, and now we set our sights on pick number 30. The safety position for the Green Bay Packers in 2018 was an absolute mess, and while the addition of Adrian Amos helps greatly, they still need to strongly consider spending a high draft pick to add someone else. As a former cornerback, Adderley like Amos, brings versatility to the backend of the secondary as he is able to play single high, in the box and although snaps were limited, he can line up in the slot as well. Adderley would also give this defense some much-needed playmaking ability, something that has been lacking in recent years. Because of his range and route recognition, Adderley is able to consistently put himself in position to make a play on the ball. During his time at Delaware, he would snag ten interceptions and record 31 pass breakups. Nasir Adderley can cover some ground!! Coming in at 6 feet, 205 pounds, Adderley has good size for the safety position while also being very athletic. His Relative Athletic Score (RAS) of 9.05 is one of the best at the safety position in this year’s class and is the exact type of athlete that Gutekunst wants to build this roster around. If there is a knock on Adderely, it is the level of competition he went up against, but don’t let that cloud your judgement. The film doesn’t lie and he checks all of the boxes. Adderley is well worth a first round pick and would help this Green Bay Packers team right away. Even with the addition of Billy Turner this offseason, I still think one of the Green Bay Packers top 50 picks needs to be spent on an offensive lineman. The offense struggled mightily last season and a big contributor was the constant pressure Aaron Rodgers was under. Green Bay gave up 3.3 sacks per game which ranked as the second most in the NFL. If this team is going to be successful, Rodgers must be kept upright. Lindstrom is a player who has benefited greatly from the NFL combine after putting up a terrific performance. He was given an RAS of 9.81 which is third best out of all the interior offensive linemen in the draft class. Like Adderely, the exact type of athleticism Gutekunst wants to bring in. Coming from the run-heavy Boston College, Linstrom is a very good run blocker. He is explosive off of the snap, gains control of his opponent and rarely lost any one-on-one matchups. Head Coach Matt LaFleur’s zone running scheme will be different for Lindstrom, but with his athleticism and footwork, he should pick it up quickly and be effective. 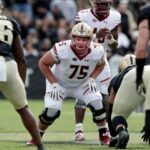 Although he may not have as many attempts in pass protection as many of the other linemen in the draft because of playing at Boston College, being a former tackle helps him greatly and he was able to keep his quarterback safe most of the time. When it comes to the offensive line position, we may not find anyone more consistent than Chris Linstrom. He has the makings of being a dominant ten year starter in the NFL and can contribute to the Green Bay Packers from day one. Although the Green Bay Packers spent three draft picks in 2018 on the wide receiver position, it may not be a bad idea to spend a high pick on that position again in 2019. For much of the season there was an obvious disconnect between Rodgers and his rookie receivers that contributed to the offensive struggles. While it did improve as the season went along and I anticipate a big jump from them in year two, this offense is still in need of a playmaker to put along side Davante Adams. Brown is a much more polished receiver than J’Mon Moore, Equanimeous St. Brown, and Marquez Valdes-Scantling were as rookies, meaning he should make a much more immediate impact on this team. A natural fit for Brown within the Green Bay Packers offense would be taking over the slot role now that Randall Cobb has moved on. Brown spent plenty of time in the slot at Ole Miss and his 6 foot, 226-pound frame combined with his athleticism would make him a difficult matchup for just about any slot corner in the league. While Brown’s ability in the slot gets much of the attention, he is much more than just that. During his time at Ole Miss, we saw his ability to play out wide as well, where he was able to stretch the field and make catches in traffic. This kind of versatility at the receiver position is something that the Green Bay Packers would love to have. It is by no means a stretch to think that Brown could challenge Geronimo Allison for that number two receiver role almost immediately. Early on in the offseason, I wasn’t on board with drafting a receiver this early, but given the free agent signings and the offense’s need for another playmaker, taking Brown at 30 should be on the Green Bay Packers radar. Pack-A-Day Podcast – Episode 274 – NFL DRAFT DAY!! !